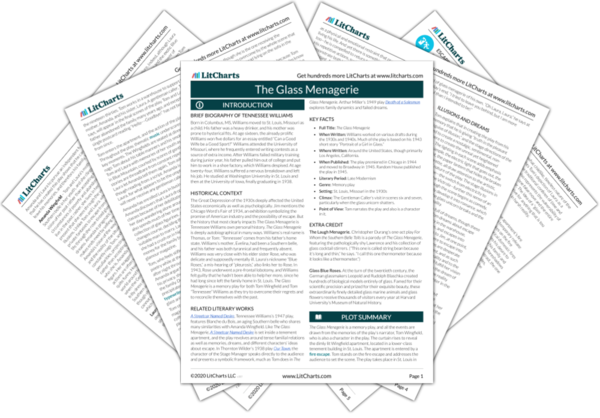 Instant downloads of all 946 LitChart PDFs (including The Glass Menagerie). 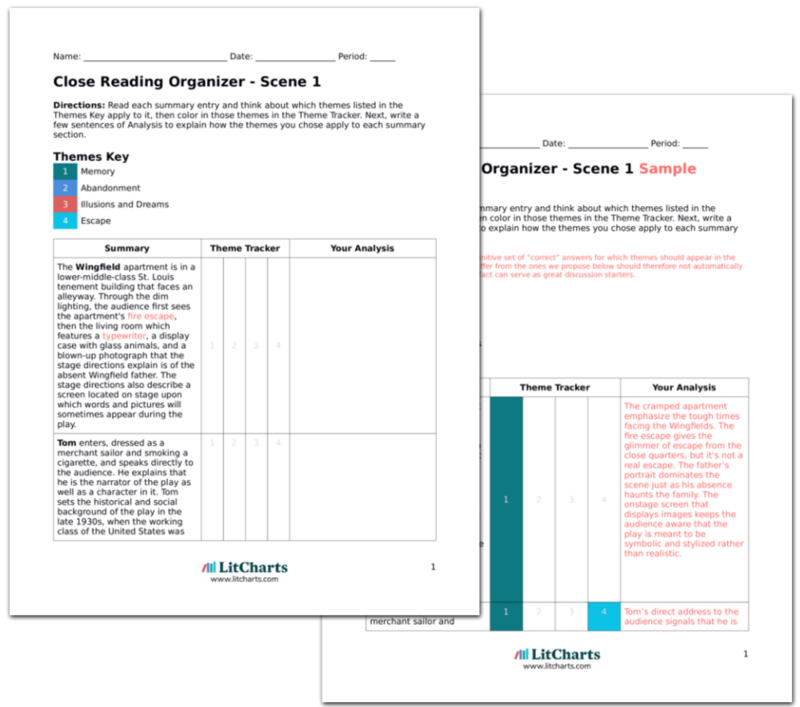 LitCharts assigns a color and icon to each theme in The Glass Menagerie, which you can use to track the themes throughout the work. Escape in the play operate in two directions: from the real world into the world of memory and dreams, as Amanda and Laura demonstrate; or from the world of memory and dreams into the real world, as Tom desires. Amanda and Laura escape reality by retreating into dream worlds. Amanda refuses to see things as they are, insisting on seeing what she wants to see. Amanda still lives as a past version of herself, even as she projects ambitions onto Laura. Rather than accepting Laura’s peculiarities or Tom’s unhappiness, she escapes into her fantasy version of the world as she thinks it should be. Laura escapes from the imposing structures of reality into worlds she can control and keep perfect: her memories, the glass menagerie, the freedom of walking through the park. When Amanda confronts Laura, she tries to escape by playing music loudly enough to block out the argument. However, both Amanda and Laura can see their present situations, and they do try to make their realities better. Amanda raises subscriptions for magazines to earn money. Instead of escaping the fighting, Laura serves as peacemaker between Amanda and Tom. Tom does not want to escape into dreams or other fantasy worlds—he wants to physically escape, to leave. And even when he can't bring himself to actually leave, he is constantly escaping from something: he escapes from the apartment onto the fire escape; he escapes from the coffin in the magic show; and he sneaks away at the warehouse to write poetry, a mental and physical escape from a menial job. He fantasizes about joining the merchant marines and escaping from not only his claustrophobic life but also the landlocked Midwest. Tom goes to the movies every night to watch an escapist fantasy on the screen. He also uses alcohol to escape reality: we see bottles in his pockets, and “going to the movies” is a euphemism for getting drunk. Yet all of Tom’s escape mechanisms are cyclical: while they offer the promise of freedom, they also trap him. “I’m leading a double life,” Tom shouts at Amanda at the end of Scene Three. He intends to hurt her so that he might break free of her power over him, but ultimately, he can’t escape his love for his family. The ThemeTracker below shows where, and to what degree, the theme of Escape appears in each scene of The Glass Menagerie. Click or tap on any chapter to read its Summary & Analysis. 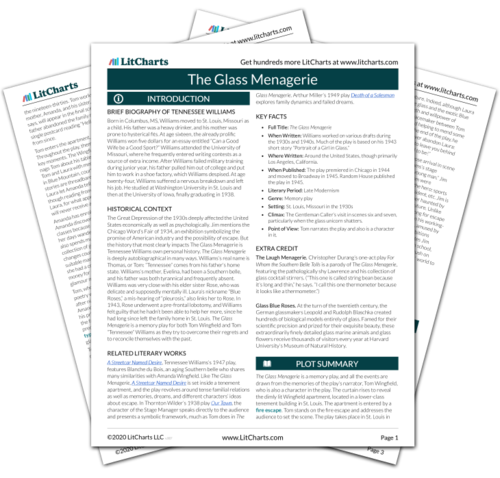 Get the entire The Glass Menagerie LitChart as a printable PDF. Below you will find the important quotes in The Glass Menagerie related to the theme of Escape. The apartment...is entered by a fire escape, a structure whose name is a touch of accidental poetic truth, for all of these huge buildings are always burning with the slow and implacable fires of human desperation. Unlock explanations and citation info for this and every other The Glass Menagerie quote. What are we going to do, what is going to become of us, what is the future? I went in the art museum and the bird houses at the Zoo...Lately I’ve been spending most of my afternoons in the Jewel Box, that big glass house where they raise the tropical flowers. But the wonderfullest trick of all was the coffin trick. We nailed him into a coffin and he got out of the coffin without removing one nail. [He has come inside.] There is a trick that would come in handy for me—get me out of this two-by-four situation!...You know it don’t take much intelligence to get yourself into a nailed-up coffin, Laura. But who in hell ever got himself out of one without removing one nail? I go to the movies because—I like adventure. Adventure is something I don’t have much of at work, so I go to the movies. Go, then! Go to the moon—you selfish dreamer! I didn’t go to the moon, I went much further—for time is the longest distance between two places. Not long after that I was fired for writing a poem on the lid of a shoe-box. I left St. Louis. I descended the steps of this fire escape for a last time and followed, from then on, in my father’s footsteps, attempting to find in motion what was lost in space. I traveled around a great deal. The cities swept about me like dead leaves, leaves that were brightly colored but torn away from the branches. The window is filled with pieces of colored glass, tiny transparent bottles in delicate colors, like bits of a shattered rainbow. Then all at once my sister touches my shoulder. I turn around and look into her eyes. Oh, Laura, Laura, I tried to leave you behind me, but I am more faithful than I intended to be! Raphel, Adrienne. "The Glass Menagerie Themes: Escape." LitCharts. LitCharts LLC, 16 Sep 2013. Web. 9 Mar 2019. Raphel, Adrienne. "The Glass Menagerie Themes: Escape." LitCharts LLC, September 16, 2013. Retrieved March 9, 2019. https://www.litcharts.com/lit/the-glass-menagerie/themes/escape.